Despite the volatile macro environment Union Bank has performed exceptionally well in 2017 resulting in a 35.6% increase in profits from operating activities to Rs. 782 million. This is in comparison to Rs. 577 million recorded in 2016, while recording a profit before tax (PBT) of Rs. 534 million, a 23% growth YoY. Gross income of the Bank improved by 39.7% to Rs. 11,938 million in comparison to Rs. 8,546 million recorded in 2016. Income growth of the Bank in 2017 was mainly driven by the core banking operations. 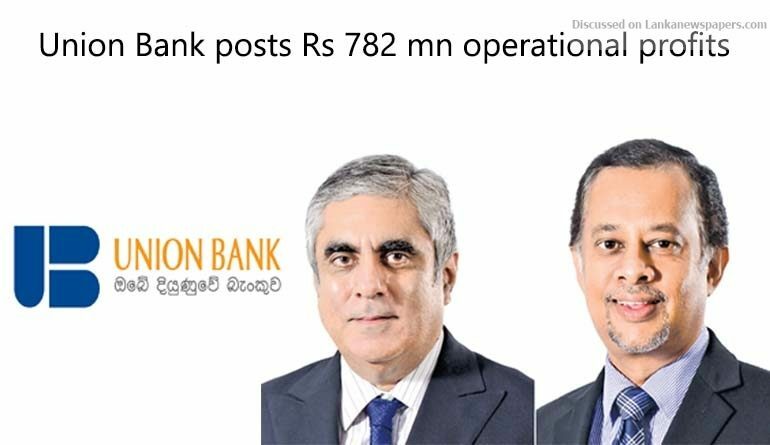 This highlights the Bank’s continuing progress in its swift transition to a full-fledged commercial bank with a wider focus on Retail, Corporate and SME sectors. The impressive results reflect the success of the rapid expansion initiatives implemented by the Bank following the capital infusion made in the latter part of 2014. The net interest income of the Bank recorded Rs. 3,046 million during the year, significantly improving by Rs. 539 million which translates to an increase of 21.5%. The rise in net interest income was mainly driven by the balance sheet growth of the Bank. The Bank’s loans and receivables stood at Rs. 70,578 million as at end of 2017. This was a growth of Rs. 15,140 million which translated to a healthy increase of 27.3%. Composition of the loans and receivables of the Bank changed in line with the Bank’s strategy for the year. The Bank’s deposit mobilisation strategies yielded good results with the deposit base of the Bank standing at Rs. 70,326 million along with a growth of Rs. 18,484 million which is an impressive 35.7% increase in 2017. Much of this growth was steered by retail fixed deposit growth of Rs. 13,284 million, 58.7% growth over the previous year. The Bank has made significant efforts to improve its fee and commission income using the key enablers established during the current and the previous years. The Bank reported a net trading and other income of Rs. 656 million. Operating expenses of the Bank was well managed and increased to Rs. 3,345 million during the year, as opposed to Rs. 3,008 million in 2016, which is only an increase of 11.2%. This is in comparison to the total operating income increase of 17.1% during the same period.